La gonna che hai scelto è ancora più bella!!! Molto piacevole questo outfit sopratuttu per la presenza del "chiodo". Oh lilli this outfit is gorgeous and I could totally see you wearing it! 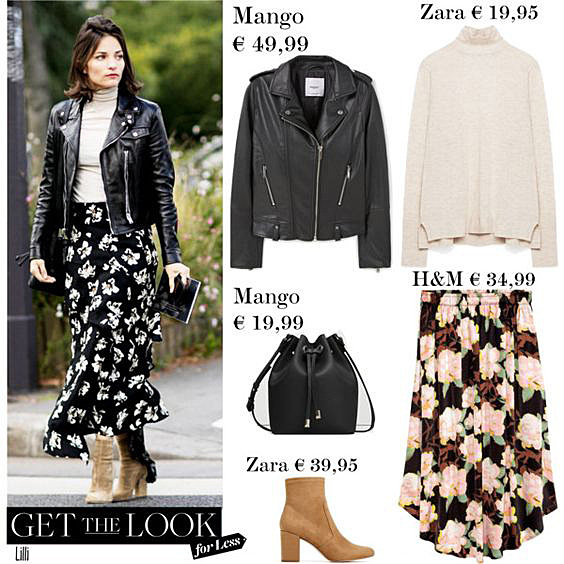 Your look for less is fantastic and I think I want that H&M skirt now! Mi sono innamorata di questa gonna fiori! Amazing Look, dear Lilli. Your Selection and Maria Dunas. This winter i´m a fan of floral, soft Skirts and big sweater. And ankle boots and leather jacket are perfect partners for such a outfit. I agree with Fashion Tales: is your name on it. I think that jacket is so versatile, it fits very well for different styles, nice combo Lilli! Kisses. great finds dear! so cute! I want a leather jacket like this! Great look; love the style. So pretty. Love the floral print for fall. It's so feminine and happy.